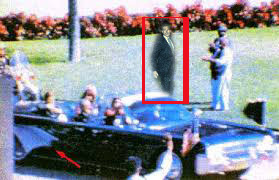 Newly released photograph clearly shows who appears to be Brian Williams serving as a witness to JFK’s assassination. Williams was on the Grassy Knoll on the day of tragedy and government spooks are trying to keep him silenced. It seems Brian Williams story goes much deeper than the world had previously expected. Days ago, the decorated and seasoned Managing Editor for the NBC Nightly News grew ire after allegedly fibbing about his experience in Iraq. In an attempt to not downplay his experience in Iraq, Williams allegedly claimed his helicopter came under heavy RPG fire, when it turns out a helicopter ahead of his flight by 30 minutes actually suffered through enemy fire. Williams told the story of his Iraqi valor since 2009, so it was questionable why suddenly global media is looking into the account and hanging Williams out to dry. Even Williams seems shocked about the story, which he retold with such clarity that it was never really questioned. As it turns out, scientists now believe Williams is a victim of MK-Ultra government reprogramming. With just the utterance of a keyword into his direct microphone feed, secret government agents can make Williams do or say anything they want. By saying, “Improvise”, they can make Williams claim he was on the Apollo moon mission or seated at the Last Supper with our Lord and Savior Jesus Christ. They can even make him misremember his experiences in Iraq, then confess to being a horrible newscaster who is delusional enough to think that if you were to lie about your experience in the Iraqi War, that taking a few days vacation from work will make the public suddenly trust your credibility again. Williams’ logic shows that he is being groomed to be a politician. It is only a politician who could perhaps lie tremendously about a war, plunge the country into a trillion dollar debt and recession then somehow gain popularity, be called the greatest president and even have a brother who is deemed ‘even more conservative’ retain a special place in the public’s heart. Sources deep in the government, the same who released the leading image from the Grassy Knoll, reveal that after Williams was there to report on Kennedy’s day in Dallas, then accidentally was caught up into seeing the second shooter and knowing Oswald was not actually the assassin, he was immediately detained by the CIA, mentally reprogrammed to be an MK-Ultra that could be controlled, then set back to public life. What was Brian Williams’ name back then? Who knows? The government likely erased his true identity from the records. What we do know is they have prolonged his life and somewhere deep in his psyche, the truth is clawing to get out. Never in the old CIA’s wildest dreams could they imagine an interconnected world where information can get place to place in nanoseconds and Brian Williams has the power of being a main newscaster whose news can instantly transform the course of history. It was just too dangerous to have an increasingly aware Brian Williams becoming fully cognizant and remembering the events of that fateful day in Texas. So they are going to drag him through the mud and hope that if the truth does come out of him, it will be taken with a grain of salt.